Whole Rotisserie Chicken - Ugg. Disgusting. Hate to throw the meat out, but....can’t figure how to mask this spice blend. Don’t try this one! 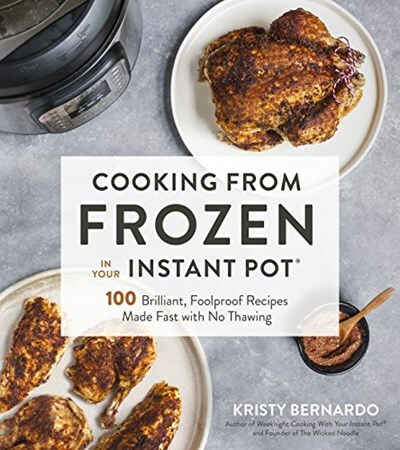 There is one question that everyone wants to know on Instant Pot forums: “How do I cook frozen meat in my cooker?” Don’t experiment at home; let Kristy Bernardo do the hard work for you! Each of the 100 delicious dinner recipes shared in these pages starts with a frozen meat and gives the exact cook time needed to put out a winning dish in less than 30 minutes average. Kristy gives important tips on cuts of meat, thickness, and size to ensure you get a great result every time. These recipes eliminate the risk of opening the pot to find your food either under- or overcooked. Plus, they save the time consuming step of defrosting meat if you forgot to take it out of the freezer in time. To her second book, Kristy brings the same elevated flavor twists that shined in Weeknight Cooking with your Instant Pot. Recipes are not simply to cook the meat correctly with a plain flavor, but instead they create a complete and delicious meal the whole family will love in a fraction of the time. Many include vegetables or starches, but only the ones that will cook properly with the frozen meat. As a bonus, each recipe also includes the cooking directions for regular non-frozen meat, making the book practical and versatile for every day. Whether you are brand new to the world of multi-function pressure cookers or have been cooking with them for years, this is the tasty and foolproof handbook every Instant Pot owner needs in their collection.